The displayed guidelines and their locations on the ground are for approximate reference only. 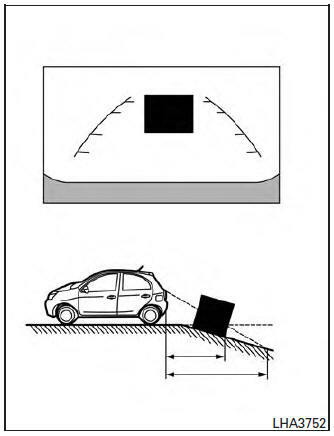 Objects on uphill or downhill surfaces or projecting objects will be actually located at distances different from those displayed in the monitor relative to the guidelines (refer to illustrations). When in doubt, turn around and view the objects as you are backing up, or park and exit the vehicle to view the positioning of objects behind the vehicle. 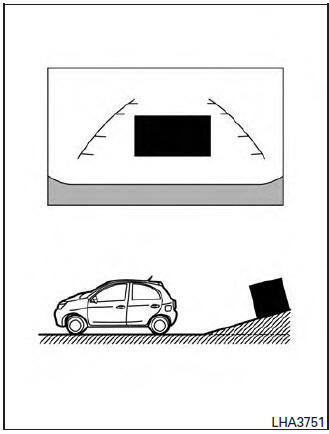 Note that any object on the hill is further than it appears on the monitor.